Recently, Hog Roast Ambleside team were hired by a local client, Julie, for her event, a rugby tour, held in Hawkshead. The venue at which the event was held was called YHA Hawkshead in Ambleside. The food was served in the classic Hog Roast team way of the buffet which was presented beautifully by the team. In addition, the team brought their own gazebo under which they set up the buffet table. Julie selected a classic hog roast menu which featured a slow roasted hog which was cooked on a spit inside the Hog Roast Ambleside team’s Hog Master machines. The hog meat was prepared, cooked and carved by the Hog Roast team’s head chefs. A selection of sides including homemade stuffing, apple sauce, crispy crackling as well as lightly floured bread rolls and wraps was served on the buffet table. Moreover, an additional meat option was added to the menu at the request of the client. This was also served alongside a vegetarian option of grilled vegetable and halloumi skewers. The service was for 45 people and so it was important that the team remained consistent and produced some really quality food. The food was also served outside so it was important that the food stayed warm and so it was placed on the buffet table in heated metal trays which were capped with lids. Julie was really pleased with the service provided by the Hog Roast Ambleside team and contacted the team to compliment them on their fantastic food which she really enjoyed. She thought the event ran perfectly and was really pleased with the successful outcome. In addition, Julie said that she would definitely hire the Hog Roast team again if the rugby team went on tour again. The Catering Manager of the Hog Roast Ambleside team, James, did a fantastic job of the food and service and helped to create a really successful event. 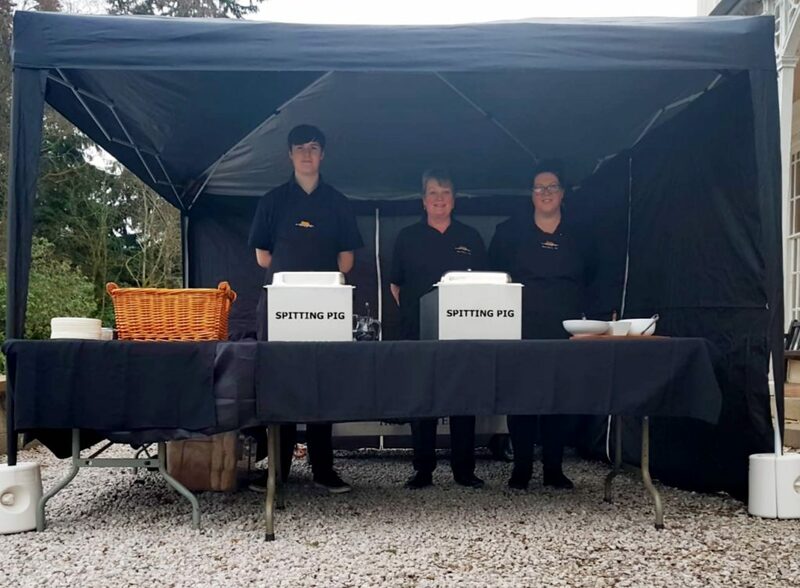 The team was made up of James’ mum, sister and nephew and the family unit was a fantastic team when it came to cooking the hog roast buffet and serving it to the guests. Hog Roast Maryport Providing A Feast To Impress Everyone!